In the wake of the 2016 election, the media dispatched reporters to rural areas across the country to gain insights into a largely ignored part of America that had an outsized impact on the outcome of the election. The resulting spate of articles provide useful perspectives and recommendations. But a clear-eyed set of solutions for the future of rural America remains elusive. The nation’s 1,976 rural counties (as classified by USDA) include nearly 72 percent of the land area of the United States and 46 million residents (out of 325.7 million). Rural America makes unique contributions to the nation’s character and culture as well as providing most of its food, raw materials, drinking water and clean air. The future of rural and urban places is inextricably linked, both politically and economically, yet policy conversations and media coverage continues to be dominated by urban-centric views. This is the first installment of a series of ANCA blog posts over the course of 2019 addressing the future of rural places. We will be looking at data, analyses, media coverage, anecdotes, trends, exceptions and the lived experience. We invite our readers to comment, share their stories, concerns and suggestions. We hope to wrap up the year with the best suggestions and strategies that people and organizations are applying across the country to turn their rural communities around. I’m at the bar in a newly and lovingly renovated 1927-era hotel. The total all-in cost over the five years of construction was $30M. The lighting is exquisite, and I’m marveling at the unusual flavor and texture of a cheese fondue made from local goat cheese. I am also listening intently to the conversation between the bartender and the glamorous couple sitting next to me. They are “in” real estate and had read a Boston Globe article about this hotel. The bartender, it turned out, worked on the renovation, including restoring the original painted beams in the great room inspired by a 14th century palace in Florence. He is telling the story of the renovation. The fur-clad couple with their expensively groomed hair have many questions. They are getting the inside scoop on the history of this iconic hotel. I had just finished my last-minute holiday shopping in town. Local merchants offer everything I needed. A long detailed conversation with Dan, the owner of the local toy shop, resulted in perfect gifts for my grandchildren. I go there a lot. I know the name of the little honey-colored dog who hangs out in the shop. Norton, in case you were wondering. I also had an inspiring discussion with the owner of the local head shop about the benefits of CBD oil, a gift for one of my daughters. And another great conversation at the hotel gift shop over the purchase of delicate silver earrings made by a local artist for my other daughter. After scraping every last morsel of the fondue out of the bowl, chased with an excellent local hard cider, I pick my way across the snowy street from the hotel to a reception for community members. These are the folks who invested in creating a community-owned store after the long-time department store had closed — the same people who had triumphed over Walmart’s efforts to open a big box store in town. This is not a glamorous crowd. Flannel and fleece, sturdy winter boots and mostly the grey or white hair of people who don't worry overmuch about the trappings of appearance — they gathered to witness the unveiling of a new name and new look for their community-owned store. This small crowd had invested — at $100 a share — $500,000 in capital to open the store in 2011. These same people just invested another $82,900 through a Wefunder campaign to rebrand the store and open an online shopping site. This small town (population 5,283) is not located near any urban centers. It is actually snuggled in the midst of a vast wilderness area that was not even fully mapped until the mid-1800s, due to its remote and intractable terrain. It's easily a five-hour drive from New York City or Boston. It’s not served by any transit system other than Adirondack Trailway buses and the nine-passenger Cape Air twin-engine Cessnas that fly several times a day between Logan Airport and a one-runway airport 15 miles away barely discernible amidst the forests and mountains. This town is both deeply rural and deeply committed to its own future. There I was, caught between the lived experience of the day before, and the data that said that cannot be. 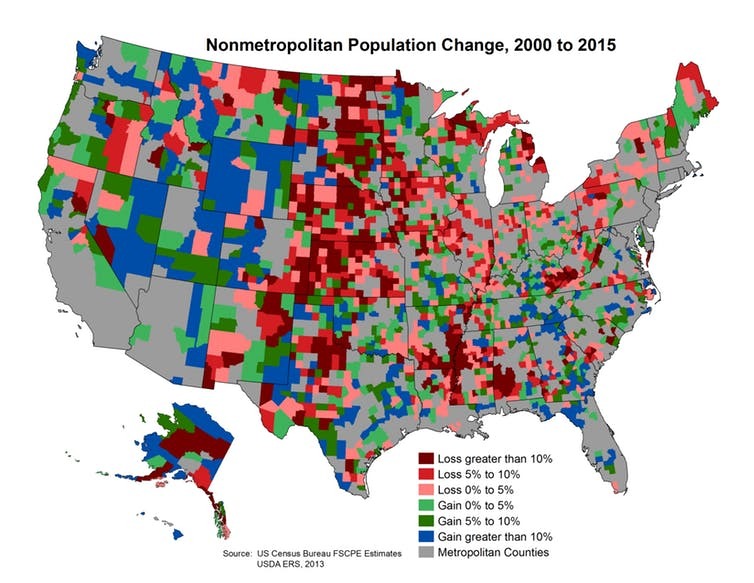 Since I’m one of the 20 percent of Americans who live in a rural place — having moved here from a large city — and since I resist the inevitability of ‘relentless economic decline,’ this article grabbed my attention. I believe that the radical and growing disparity — between the wealthy and everyone else and between the apparent flourishing of high-population urban centers and the apparent decline of rural places — ranks second in terms of global crises, right after climate change. And these two challenges are inextricably linked. If we collectively can't figure out how to reimagine our economies to work for all people — not just the top layers — and to work in ways that protect and support ecological resilience, then all bets are off for the future. Rural communities and rural landscapes are at the heart of this intersection of global challenges. So, we will be exploring this topic deeply and widely over the year, looking at the data, at the stories and at the people and places of hope and action. We will also be looking at the more difficult topics of culture, education and unexamined assumptions about each other that permeate so many conversations about this topic. Please come along with us on this journey. Top photo: Dan Sporn, owner of Goody Goody’s in Saranac Lake, and his sidekick Norton. The downtown store offers an impressive selection of games and toys, as well as opportunities for community connection and conversation. Bottom photo: Downtown shops along Main Street in Saranac Lake weather a cold winter morning.